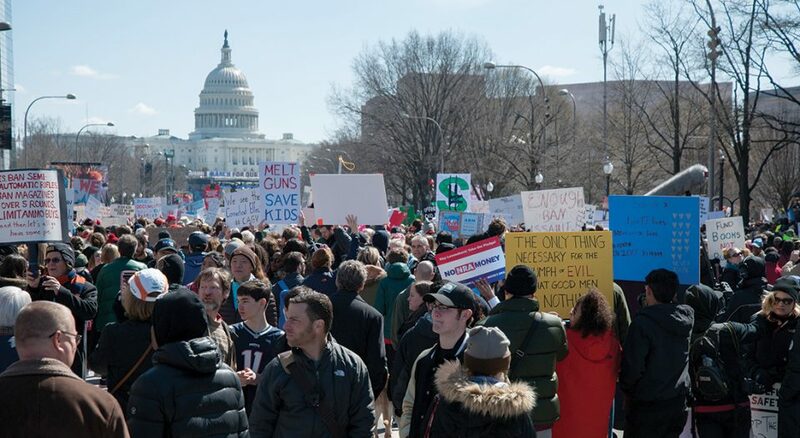 Youth participate in the March for Our Lives demonstrations on March 24 in Washington, D.C.
ELCA youth and adults joined thousands for the March for Our Lives demonstrations on March 24 in Washington, D.C., and across the nation. The events were organized by student survivors of the Feb. 14 shooting at Marjory Stoneman Douglas High School in Parkland, Fla., that killed 17. “I want to march so that our politicians can hear us and hopefully never let this happen again,” said Bruce Elkins, a 15-year-old student at Somerset Academy in Deerfield Beach, Fla., 10 miles from Marjory Stoneman Douglas. “It doesn’t matter the age, religion or ethnic background—America needs to protect [its] kids.” Elkins, a member of Zion Lutheran Church in Deerfield Beach, attended the Washington, D.C., demonstration with his father, Drew Shimkus, and friend Jamal Jackson. As of March 20, ELCA members have given $144 million in cash gifts and gift commitments to Always Being Made New: The Campaign for the ELCA, according to staff reports. This represents 73 percent of this church’s goal to raise $198 million for Lutheran ministries by Jan. 31, 2019. “The Lord has blessed this campaign. We have accomplished so much together. Yet, there is more work to be done,” said Ron Glusenkamp, campaign director. “We’re inviting individuals, congregations, synods and our partners to join us as we rally and make additional gifts to these life-giving ministries.”. According to a recent study published by LifeWay Research, 81 percent of Protestant pastors say their congregations are predominantly made up of one racial or ethnic group, which is down from 86 percent in a similar LifeWay study from 2013. However, pastors of congregations of 250 people or more were less likely (74 percent) to say their congregation is made up of predominantly one racial or ethnic group. Lutheran pastors were most likely (89 percent) to report a lack of diversity. The ELCA ranked fourth highest among U.S. religious groups in the percentage of members who are married, according to a study by the Pew Research Center. With 61 percent of members identifying their relationship status as married, the ELCA followed Mormons (66 percent), the Presbyterian Church (U.S.A.) (64 percent) and the United Church of Christ (64 percent). The other marital status identifiers were “Living with a partner,” “Divorced/separated,” “Widowed” and “Never been married.” The ELCA’s percentage of married members is higher than the national average, with 48 percent of all American adults identifying as married. The Lutheran World Federation (LWF) announced in March that its Wittenberg Center will remain in Wittenberg, Germany, for the next 10 years. Founded in 2008, the center offers Lutheran theological seminars to participants from LWF member churches. The center is an institution of the German National Committee, which represents LWF churches in Germany. God’s creation teems with God’s life-sustaining presence. Just as all plants and creatures depend on ecosystems, humans depend on a community of human and non-human life. This interdependence is not only about survival but about our self-identity. We create meaning and feel belonging based on our surroundings. Every year, ELCA partner Creation Justice Ministries offers Christian education materials to equip faith communities to protect, restore and share God’s creation. This year’s theme is “Sense of Place,” and the materials offer insights about living in harmony with local ecosystems and watersheds; rightly sharing places with a diversity of people; and respecting the history of your place. “Ecumenical leaders’ intention for the resource is to encourage Christians in the United States to engage in spiritual practices that help us be more present to one another and our local watersheds,” said Shantha Ready Alonso, Creation Justice Ministries executive director. Throughout the year, ELCA Advocacy is encouraging Lutherans to learn more about protecting creation. Adam Copeland teaches at Luther Seminary in St. Paul, Minn., where he is director of the Center for Stewardship Leaders.